Home Weapons Is Graviton Lance The Best Exotic Pulse Rifle? Since this week Xur has brought Graviton Lance to the EDZ we thought it was time we took a look at whether or not it’s the best Exotic Pulse Rifle in the game. When it comes to the competition it’s up against we’re looking at Vigilance Wing, a strong weapon for both PVE and PVP. Let’s dive into the stats for Graviton Lance and see what we’ve got. The stats on the weapon are; fires 257 rounds per minute, has an Impact of 29, a Range of 55, Stability of 100, a Magazine Size of 31, a Reload Speed of 61, and Handling of 59. The hidden stats on graviton Lance are; a Zoom of 17, Inventory Size of 60, Aim Assistance of 60, and a Recoil Direction of 65. These stats sit nicely down the middle of things. This isn’t exactly what you’d want from a weapon but also isn’t bad. What we don’t have here are any stats that are below the middle mark that matter terribly. A lower Impact rating isn’t necessarily that bad in a Pulse Rifle because it would increase the recoil on the weapon, meaning subsequent shots will miss their mark. The stats are definitely boosted by the perks, and Graviton Lance has some really powerful ones. It may be that you’ll find certain perks on this weapon, and it may be that some of them are rolled out with the random rate given to most weapons in Destiny 2. We’re going to look at the perks on the weapon over on Destiny 2 DB, which is generally an accurate representation of what you’ll get. The Exotic perk on Graviton Lance, which won’t ever change with a roll, is Black Hole. This makes the second shot of every burst rip a hole through space and time, meaning it’ll hit your enemy without falloff, deal increased damage, and cause zero recoil. This is an extremely powerful perk, basically allowing you to hit with around a third of your magazine without the penalties that come with normal shots. 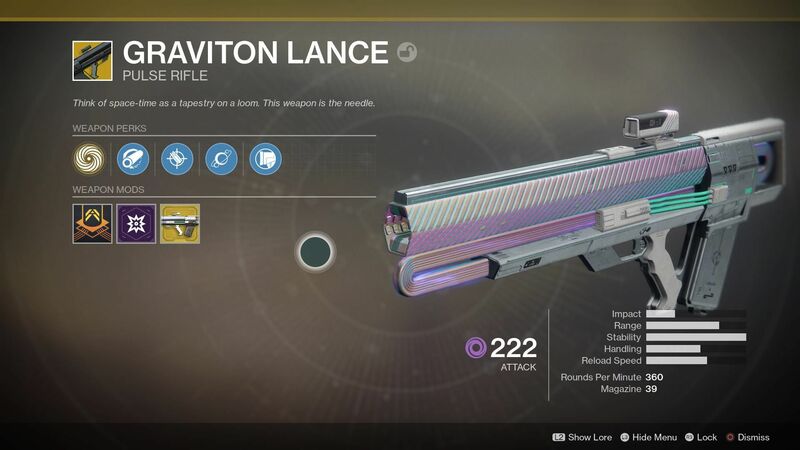 The rest of the perks on Graviton Lance, according to Destiny 2 DB, are; Hammer-Forged Rifling, which increases Range, Accurized Rounds, which increases Range again, Cosmology, which causes enemies killed with Graviton Lance to explode and spawn Void projectiles that track down other enemies, and Fitted Stock, which increases Stability, moderately controls Recoil, and slightly decreases Handling Speed. Overall these perks paint the picture of a weapon best used from a distance, a great distance. The added Range means that you’re going to be getting kills from almost half the map away in the Crucible, and that Black Hole perk will stop your shots from missing their mark a good portion of the time. The feel of Graviton Lance is definitely one of accuracy. Your damage is more accurate but also slightly decreases if your target is moving a lot. In PVE I can see this being very useful for those bigger enemies or bosses, and in PVP you’re going to be dealing a lot more damage to moving targets from far away. I think the biggest disadvantage to Graviton Lance is definitely that, while a third of the shots are super accurate, you’re only really dealing a decent third of your magazine in terms of damage. So, is Graviton Lance the best Exotic Pulse Rifle in Destiny 2? We still stand by our decision made in our look at Vigilance Wing. While that Exotic Pulse Rifle has a boost from its Exotic perk, allowing it to shoot a 5 round burst as opposed to a 3 round burst, there’s more recoil and no advantage to those shots hitting their mark. Graviton Lance is an ace up your sleeve. It’s the mound on top of the sugar pot of your armoury, that sweetness giving it a cut above other loadouts. Let us know what you think of Graviton Lance in the comments, and if you want it make sure you head over to Xur this weekend and pick it up.